have learned to evaluate the irrigation system in ways in which our clients had not thought of. They are always pleased when we provide low cost solutions and conditions begin improving immediately. 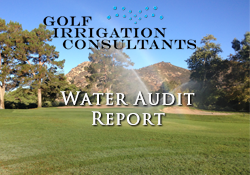 It is not uncommon to find that many golf courses are spending 5-20% more on water costs due to many factors which are difficult to detect unless a professional water audit is conducted. As the years go on, there are problems and changes which occur in the field that are not accurately reflected in the central computer, parts wear out due to wear and tear through time; dry spots are often over-irrigated to compensate for inefficient spacing or sprinkler selection. These are just a few factors which often add up to over-irrigation which effects the bottom line! A system evaluation and water audit that includes a catch can test for distribution uniformity is a reliable tool. The results can be a reliable indicator of a problem with the pumps, sprinklers, hydraulics or programming. 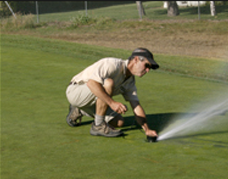 Golf Irrigation Consultants offers a comprehensive system audit where we evaluate all aspects of your irrigation system during it's normal nightly irrigation cycle. We test for 24 hours utilizing digital pressure recorders, as well as testing sprinkler head pressure. Many problems which we detect and observe at night under normal operating conditions can't be replicated or detected if only done during the middle of the day. If flow meters are installed at the pump house or water source (highly recommended), we utilize this data and compare it to how the central computer is programmed. It is not uncommon to find a large differential between these two reporting systems which could be causing low pressure problems. This leads to the need to over-irrigate to make up for lower system pressure. There may be low cost alternatives including an irrigation sprinkler audit followed by some simple changes in the central computer. This may add up to significant cost savings and simultaneously improve turf conditions on the entire golf course. A comprehensive system / water audit may cost between $5,000-8,000.00 depending on the system, size of course and the clients specific preferences. The cost of conducting a system / water audit is quite affordable given the fact that we can help provide solutions which can save 5-20% on your water and power costs. Golf Irrigation Consultants is proud of the work we have conducted which has resulted in significant cost savings for golf courses. Many Golf Course Superintendents and General Managers often use our professional audit reports to properly budget and anticipate the need to upgrade their systems. Although a system upgrade can be a significant investment, the cost savings over time far outweigh the costs associated with an inefficient system due to ongoing repairs, and high water and power costs.